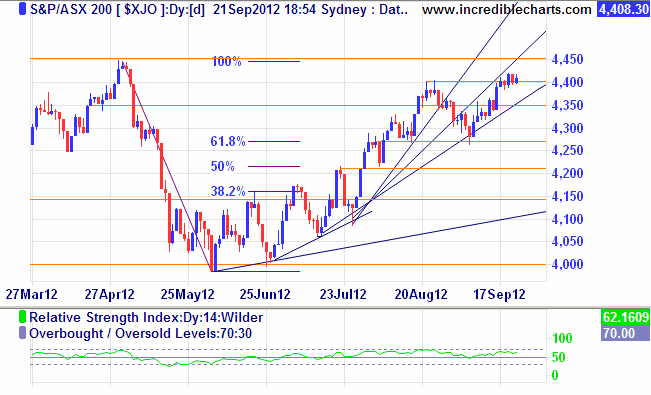 XJO forms a new high. Last week’s strong gains were not followed up this past week. Although a new high was formed at 4420, maintaining the uptrend, it was hardly convincing. Profit taking was to have been expected this week; it is a positive that the outcome was a pause in trending and not a pull-back. My expectation is for another leg higher to emerge from this temporary consolidation; this is likely to test the next resistance level of 4450. Despite the fact that global economic woes linger, and some analysts believe the mining boom in Australia is over, the share market is pointing towards improving rather than deteriorating trading conditions. ‹ How do you stop High Frequency Mayhem?